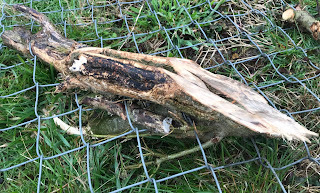 Over the last few years, I have often lamented how much hay the goats have wasted as they pick through the feeder for the very best bits. Whatever hay hit the ground while they were eating was no longer considered food grade hay in their tiny minds. What a waste of hay! By the end of the winter, I would always end up with all three compost bins full to bursting with this wasted hay and this year was no exception, in fact this year I had all three bins full with mostly finished compost plus another pile just as large of half done composted hay, and a barn full of bedding that needed to go somewhere. I was not sure exactly what I was going to do with it all. I did give several bags of compost away, and that helped some, but I had put off cleaning out the barn due to lack space. I considered moving the compost bins over to a wooded area on the other side of the barn, partly because it would hide them a little bit from the house, and I had taken a couple of wheel barrows full out there, but I stopped when the weather got cold again, and it is a good thing I did. 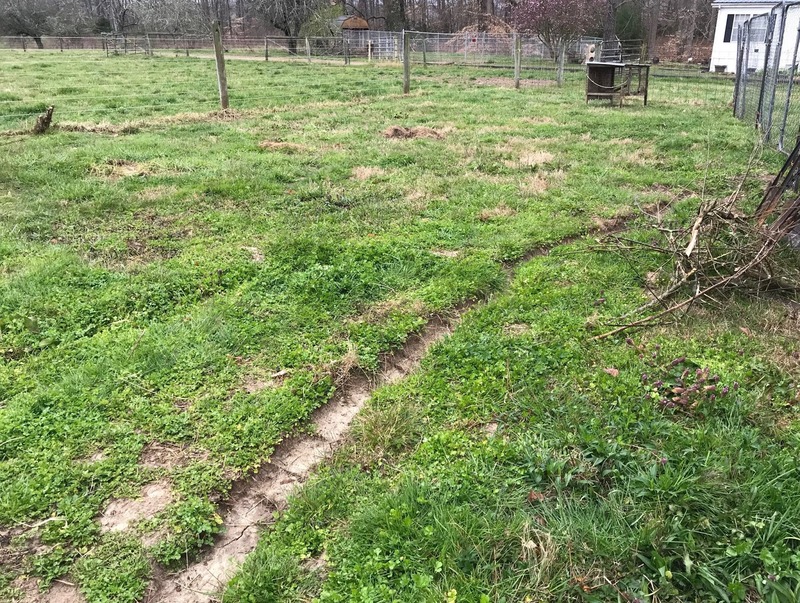 After considering several places around our little bit of East Tennessee, we decided that the old chicken yard would certainly have enough sun, but it needed a makeover to be ideal. 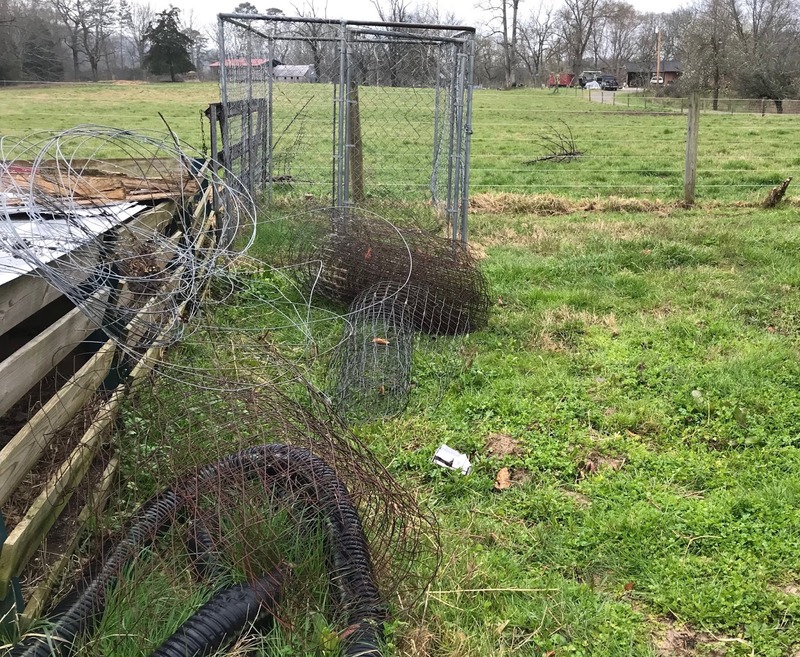 I got out of chickens several years ago and this space had been incorporated into the goat yard, though they rarely made it over there. What a waste of a sunny place! Early March I was looking on YouTube for some gardening ideas and I ran across "Roots and Refuge Farm" and I liked her encouraging approach to gardening. 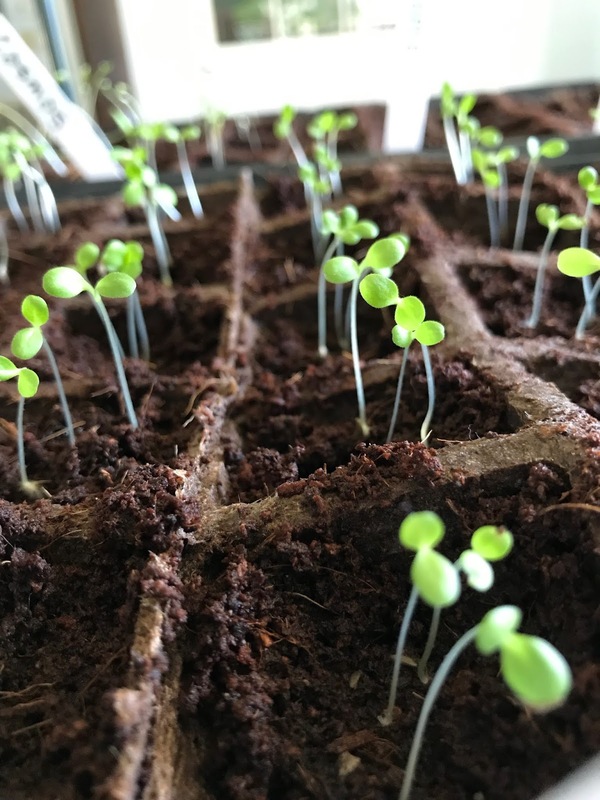 I watched many of their videos over the next few weeks and knew that time was a wasting if I wanted to get a garden in this spring. March 25th I began to transform the old chicken yard into a "no till" "deep mulch" garden. Ruth Stout is my champion here, she wrote several books about it in the 50's and 60's. 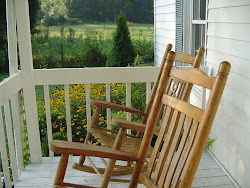 The first book I read by Ruth Stout was "How to have a green thumb without an aching back". 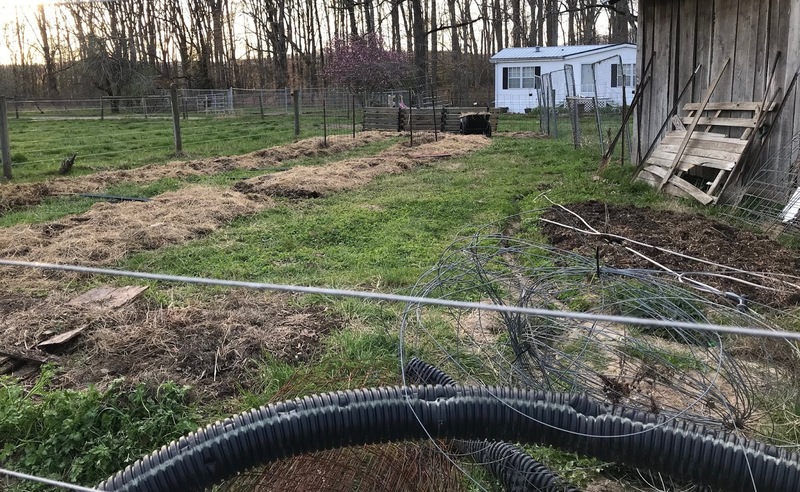 She switched to a continuous deep mulch system on a well established garden that she had been cultivating already for 10 years, so she was ahead of the game there. All she had to do was to import bales of hay and scatter it around and voila, deep mulch almost weed free, rich garden. My story is much different, I think the "no aching back" comes later. I managed to take some before pictures, but that was after I had moved the chain link fence panels to close the garden off from the goats, so you will have to use your imagination just a little bit. This boxwood stump used to have a chain link panel running just to the left of it, and it took me several hours using a handsaw to cut the fence away from it. I will have to take an axe to the stump if I want to get rid of it! I am going to keep the rest of the stump in the panel, as a conversation piece, but mostly because I can't get it out! From the front of the new garden looking towards the back. You can see the stump of the boxwood to the left and the chain link panels in their new position to the right. Now, looking to the left of the previous photo, you can still see the stump on the right and a dog kennel and some old fencing and stuff in the center and finally the 3 compost bins on the left. The first step was to empty the compost bins, so that I could move them to the back of the garden. I decided where I wanted my 4ft wide beds and I began to move the finished compost, spreading it onto the beds using my wheelbarrow and a pitchfork and sometimes a shovel. (I got the wheelbarrow for my Birthday last year, it has 2 big wheels on the front, no more tipping over!) I put a 2 inch layer of finished compost on all of the beds. 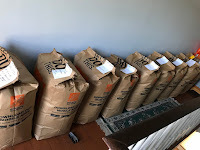 I moved each compost bin as I emptied it by rolling it end over end, it took some doing, but by tumbling the bins, I didn't have to take them apart and reconstruct them all over again. This phase took a couple of days to complete, with frequent rest times. That compost was really really heavy! When I finished distributing the compost, I began to clean out the barn with the dry hay that was on the floor. The hay was much, much lighter and easier to move as I put an 8 inch layer of the hay on top of the composted beds, and I managed to empty most of the barn in one afternoon. The dog kennel was still in the way so I contacted a neighbor to see if she could use it and she could! She also took a small hutch that could be used for a broody hen. Since those two things were out of the way I could finally finish laying out the new garden beds. If you click on these pictures to make them bigger you may be able to see the old compost bins at the far end of the garden. If all goes well they will not be used for compost anymore, at least not all three of them. From now on the hay should go directly onto the beds. 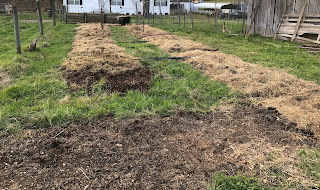 You can see in this photo that I have started the bed by the barn but I wanted to use the last of the finished compost on the bed in the last photo before I put this bed in. 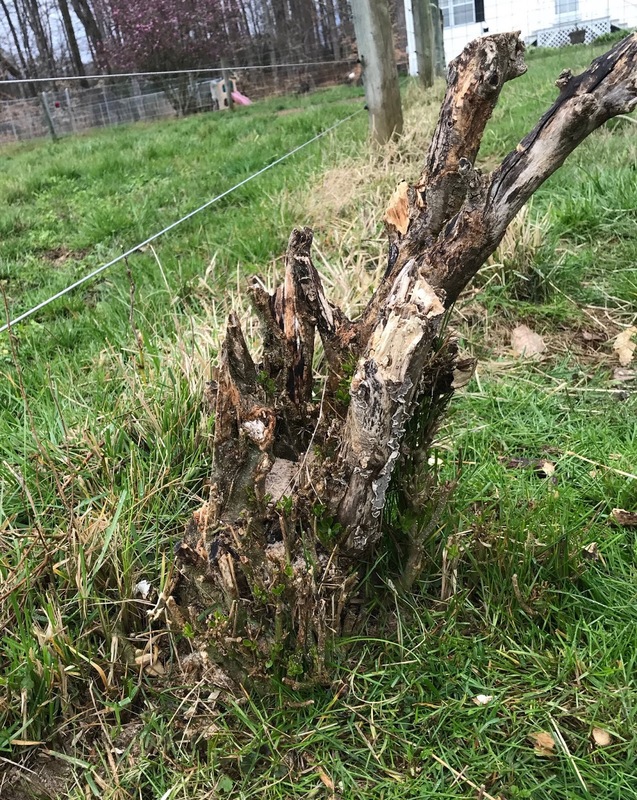 There is also in the foreground of this picture a bit of old rusty 2x4 fencing that I have cleared from this area and from the goat area as well. 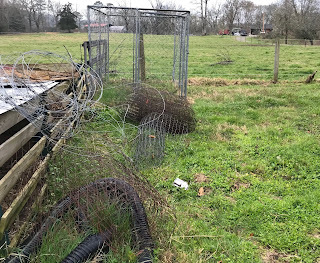 It was an unexpected goat pen clean up as I began to remove fencing I no longer needed for them. I would use these cattle panels and t-posts to use in the new garden as trellis'. 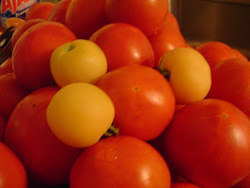 I got the idea from "Roots and Refuge Farm" on YouTube, they use cattle panels and t-posts to make arches over the pathways in the garden and they train indeterminate tomatoes plants, (and other vining plants) up and over the trellis' to keep them off of the ground and within easy reach for harvest. For bush tomatoes they use the 16ft cattle panels as well, but they don't arch them over the walkway, they run them the length of the bed, again on t-posts. I'm not done with the hard work yet, once I get the last 4 trellis' in place,(no easy feat in itself) it will be time to bring in some rough wood chips for the pathways, to help keep the weeds down and help absorb rain water that might make muddy pathways otherwise. 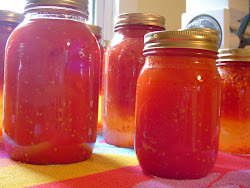 This being the first year of the garden, I am not expecting miracles in the weed and productivity department. If I had done all of this last Fall as the grass and weeds were dying, (as I would have, had I known I was going to be into gardening) then I think the weeds would already be fewer and the soil already much richer. As the years go on though, if I keep it up, the soil will definitely improve and I think that this will truly be a way to keep the weeding to a minimum, and that is what has always defeated me in the past. Even though the garden is not quite finished, I have already put a few plants in, I am excited about it and I can't wait for the last frost date to pass, April 13th I think, but that will all be for another post, for this one is quite long enough. It seems that I only have so much creative energy to spend in any given day, week, month or year. These last few years have been less creatively spent than the previous years, because of ongoing family responsibilities, ongoing (non life threatening by any means) health issues and probably a propensity to collect a lifetime supply of any craft that captures my imagination and my fancy. I looked back over the last few years posts and had a good chuckle at how all this is plain to see to anybody that cared to look! I am not proposing to turn over a new leaf, or chuck it all out, or give it all away, or anything of a sort, but what I am finding is that I am more inclined to delete all solicitations from my favorite stores and to turn a blind eye to almost all wheels, looms and supplies that I find for sale while I ramble along online. 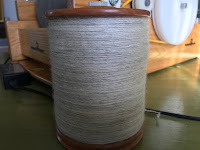 I tend to cycle through my crafts, now spinning is the thing, now weaving is my passion, now knitting is in the forefront etc. I am learning to live with this tension, and to go with it as I can. Like I said my "me time" is not what it once was and I am okay with that. 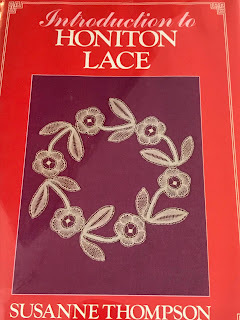 Lately, the bobbin lace pillows and bobbins have been calling, and since I do try to learn something new every year, I pulled my supplies back out, looked through a listing of all the different types of lace that there are in the world and I chose to focus on an English lace called Honiton, and a Belgium lace called Duchesse sometimes with the distinction of Withof, and Roseline Perle. Since I already had quite a few resources to learn Honiton, including a video lesson, I started with that. 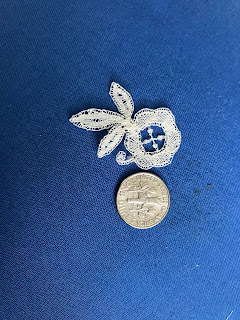 Honiton lace is really quite small, so small in fact that I need a magnifying glass to properly see the threads and holes and pins even. 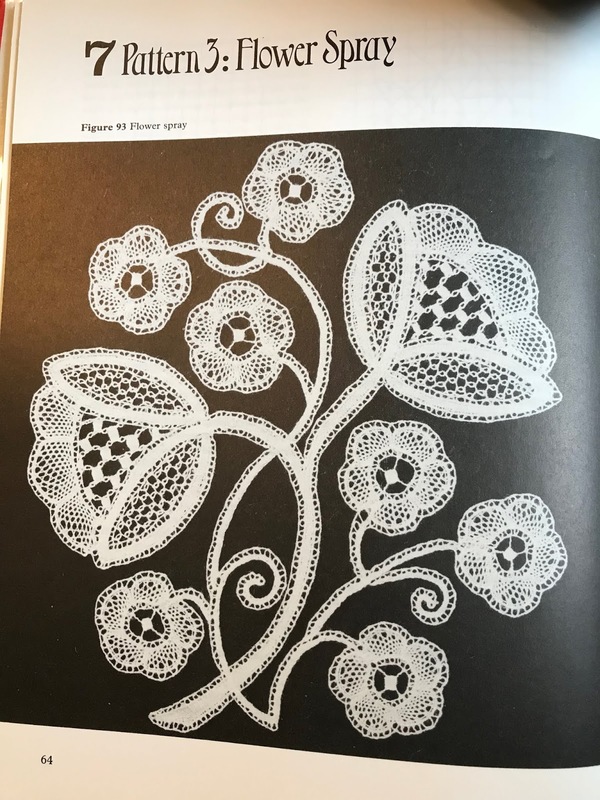 I started, like I said with the video course by Mo Gibbs, called Honiton Lace, and I can't recommend it too highly! 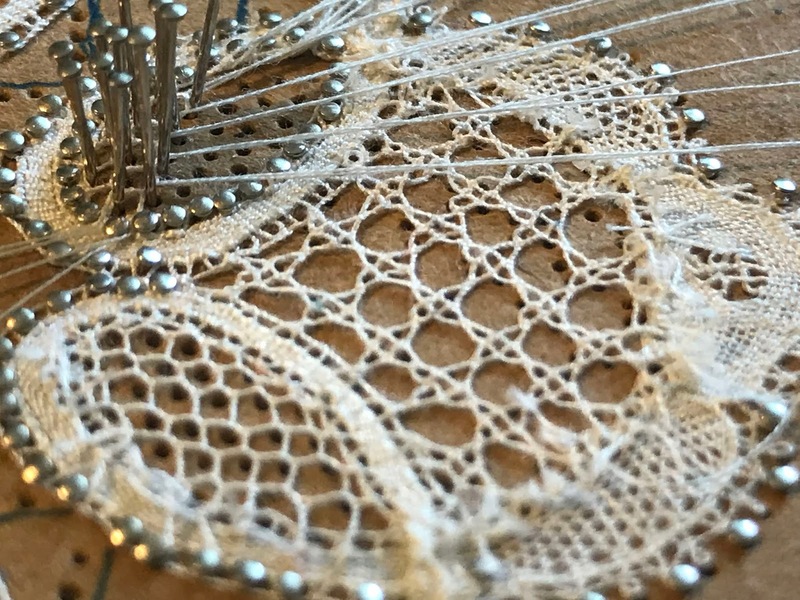 (To make the most of the video, it is good to have a working knowledge of the basic bobbin lace stitches.) Mo takes you through the lesson with clarity and humor, both of which were needed! 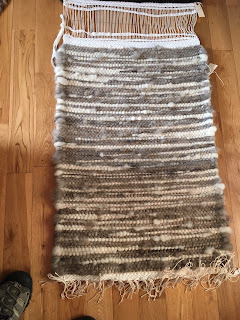 When I had finished the project I posted it on my weaving groups blog, but I will post the finished piece here as well. Now you can see why the magnifying glass was so important! There are errors of course, but they don't upset me at all, I learn what to look for and how to do it better. I can see for example that I forgot to pull the thick thread (called the gimp, which I had never used before!) 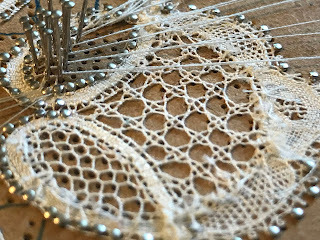 tight enough, and so there are in a few places a wobble in that thread, when it is supposed to make a lovely border around the whole piece, You can be sure that I have remembered it ever since! Some of the other things I learned from the video were how to work my way around the petals of the flower like the rays of the sun rather than the work sloping one way or the other. This involves using almost all of the inner pin holes more than once so that the outside of the petal can keep pace with the inside. Then there is the dreaded "lead work" in the center of the flower. Those are supposed to be tiny woven rectangles, I'll just say there is room for improvement and leave it at that! After I finished the video course, I turned to this book. I have skipped the first project since it was almost identical to the video project I had just done, and after reading the book cover to cover, I have embarked on project number 2. 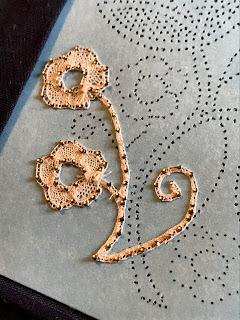 In project number 2, I am introduced to making a whole stitch braid with "picots", a couple of different "holes" in the whole stitch braid, and fillings. 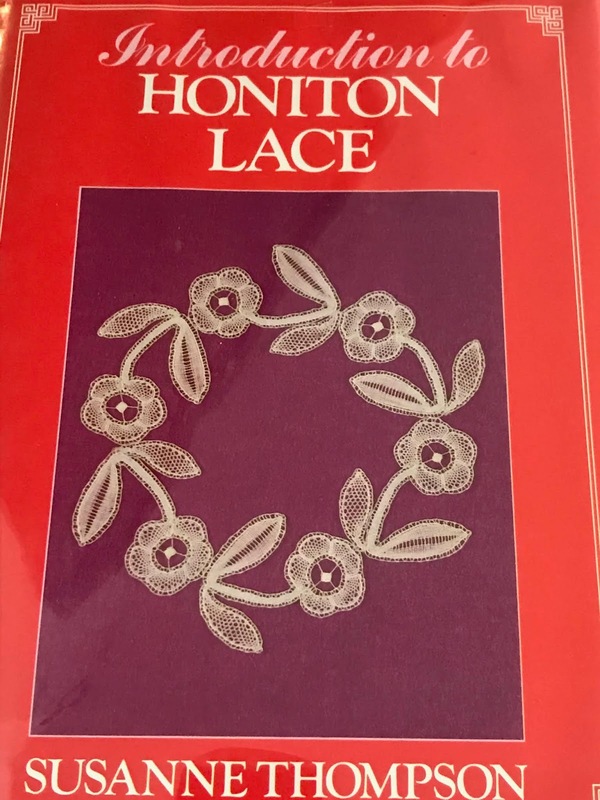 "Fillings" is one of the distinguishing features of Honiton lace, and there are quite a variety of them. In the close up picture of this piece, to the left, you can see in the braid, whole stitch and half stitch. 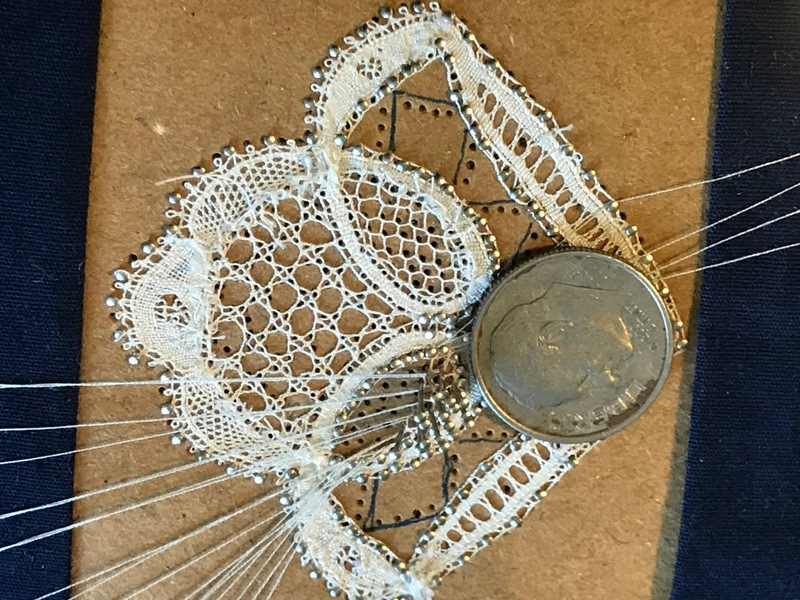 Then you can see in the larger space is "4 pin" lace, and finally in the smaller loop is "trolley" lace, which I am in the process of duplicating in the loop above and to the left in this picture. 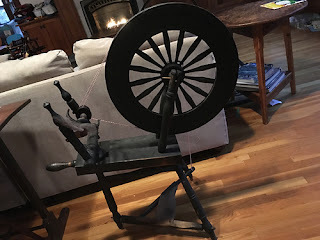 Once I have completed filling this loop, I will only have one more area to fill, and it will involve just a few bobbins, but quite a few "picots", which I am glad to say I have finally figured out how to do. Picots are the cute little loops you can see at the side opposite the dime in this picture and the one above. 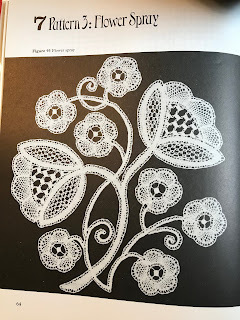 My present book has 2 more projects, and my plan is to finish both of these and then look at the 2 other Honiton books that I have and see which projects will help me understand this beautiful and challenging type of lace. As I progress, I will be sure to post pictures of the finished pieces. 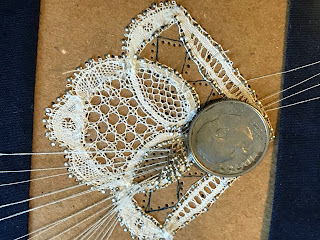 This piece is supposed to become the lace corner on a filmy handkerchief, I think I have a plain one on hand I can use for this. If you are a Knitter or a Spinner or Weaver, you will know what those 4 letters in my post title mean. The rest of you should know that they stand for "Maryland Sheep and Wool Festival". If you ever get a chance, as I did this year, you should go! 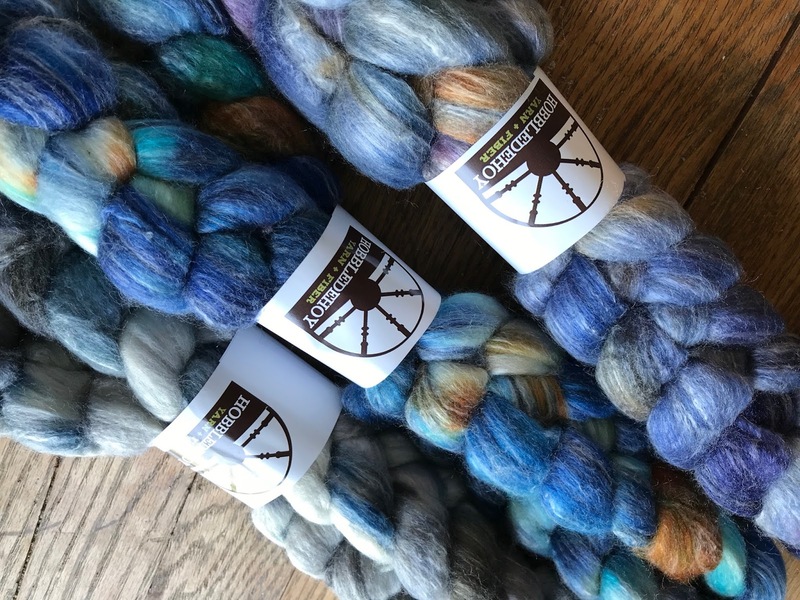 I heard that there were 40,000 crafters that attended this event, and there were plenty of booths filled with all kinds of yarn, prepped fibers and full fleeces to keep them all busy. 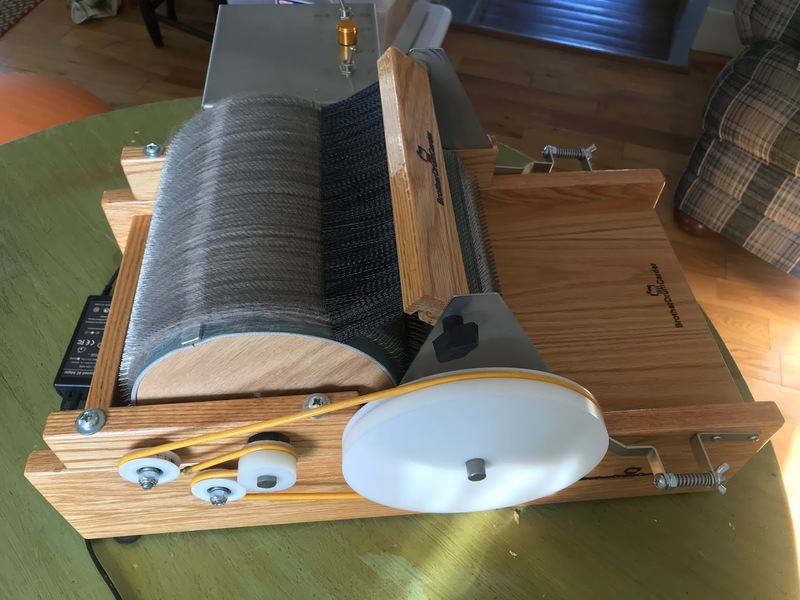 I did not do any of the classes, but I did attend a lecture on the "History of the Warp Weighted Loom in the Shetland Islands". We drove up on Friday and spent the night in Colombia, just 20 minutes from the Howard county fairground, in Friendsville, MD. We drove the next morning to the fair ground, and I dropped my daughter off close to the entrance so that she could make it to her booth at the far end of the fairground, then I proceeded to park with the help of a local boy scout troop. In my car there were 2 great wheels that needed to be delivered to 2 separate people. I had their phone numbers already in my phone, and within a few minutes had made contact with one of them that was just a few rows over from where I had parked. We quickly loaded her wheel into her car, and she went on to the entrance while I waited for person #2. 30 minutes later, I was moving the last great wheel to her car, and loading up 2 flax wheels into my car! One of these was a flax wheel that had belonged to the Joan Cummer collection, and then to the ATHM until it closed late last year. This is the first picture that I saw of the wheel, and since it was for sale, I gladly purchased it. As our plans for MDSW developed, it was decided that the wheel swap would happen there. Leaving those beautiful braids with my daughter, I went directly to the fleece room. 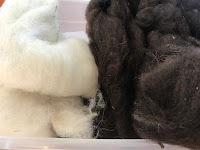 I was looking for a light brown Shetland fleece to add to my stash for making blankets. 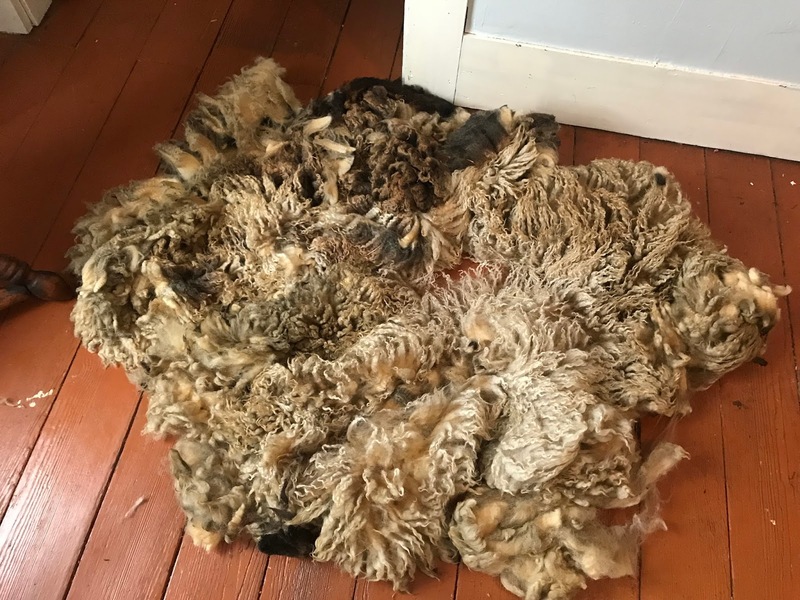 Sadly I didn't find one that I could afford, but I spent the next hour going around and looking at the fleeces and adding to my knowledge of the breeds I had not yet seen in person. There was some super soft Merino, but when I saw the price per pound, ( $47) I slowly backed away, way too high for my pocketbook. (almost a $200 fleece) I also looked at the Finn fleeces, hoping to find a small one, since it is on my bucket list of fleeces to try, but with no luck as the prices there were again high for me. I left the fleece room, with the plan to come back the next day when a lot of the nicer fleeces would be gone and some great deals can be found. I toured the sheep barns by myself and then when my daughter was free for lunch, we ate together and then toured the huge yarn and prepped fiber barns, and then the tented booths. 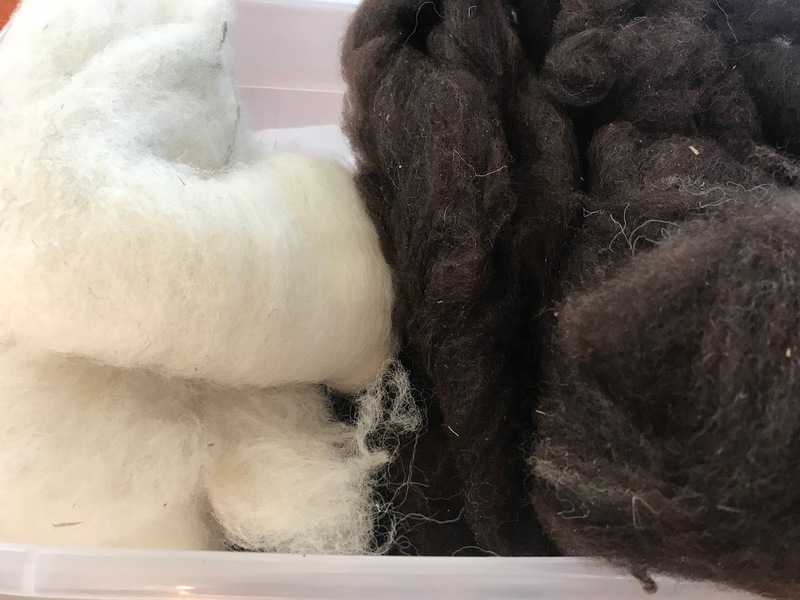 The only other thing I picked up was 2 ounces of a Yak/Silk blend that I had been wanting to get for several years, and never did. When I got tired I sat down and knitted, there were lots of places where knitters gathered in pic-nic style with chairs and blankets, it was relaxing. On Sunday, I went straight back to the fleece room, this time, I looked at each and every fleece. I almost picked up a Finn Cross, but decided that I didn't want a cross, unless I knew what it was crossed with. 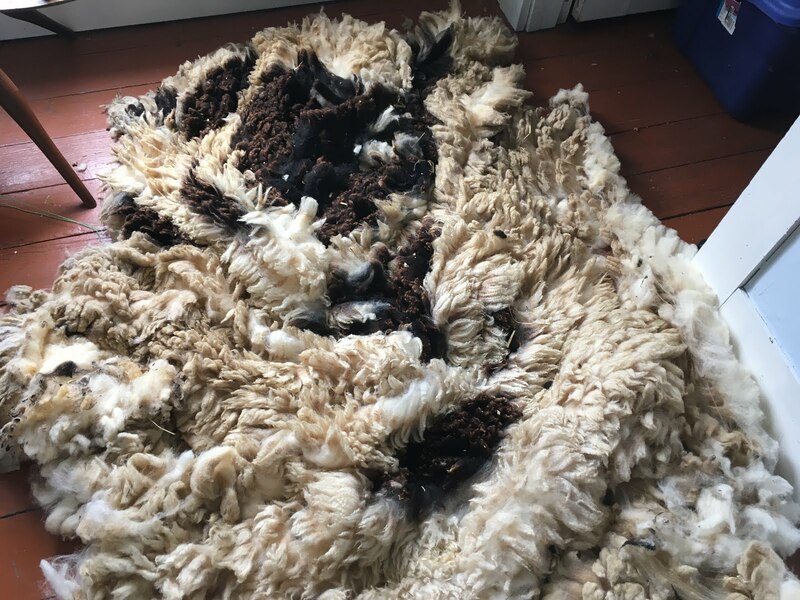 There were far fewer fleeces than the day before, so it didn't take long to go through them all. 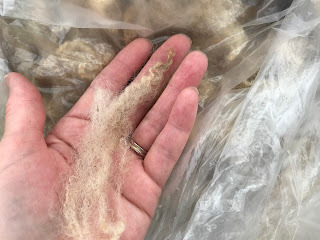 Towards the end of my hunt I happened across a Finn fleece that had not been coated, and I believe it is the filthiest fleece I have seen to date, however, it was only $6 a pound! I was impressed with the length of the locks and the softness of the fibers, and I am not afraid of dirt! Lots and lots of dirt! Which washes right out to leave a beautifully soft white fleece. I was sold, and quickly made my purchase. 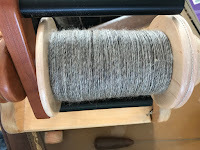 I dropped the fleece off behind my daughters booth and went to the lecture, on "the history of Warp Weighted looms in the Shetland Islands" which I found fascinating! Once the lecture was completed, I met my daughter again for lunch and a quick tour of some more of the booths. When she went back to work, I made sure that I had seen all of the sheep that were on the fair grounds, and then went back to her booth and bought 3 more braids! I decided that it was time to take a trip back to the car with my purchases so that they would not be in the way while we packed up the booth. On my way to the car I decided to get another 2 ounces of the Yak/ Silk blend, just because 2 ounces is not enough to do any real project. 5pm rolled around and we quickly broke the booth down and loaded it into the van. Then it was hugs all around, until next time. We spent the night with friends who live in the area, and early Monday morning we were happily on our way home. I have decided that it was the best trip ever! Who knows maybe we will get to go next year too! It has been a long road from buying 50 something Jacobs fleeces and where I am now. 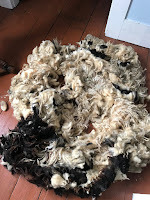 Last Fall, I processed several fleeces and quickly made batts to use as weft for rugs. 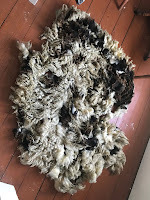 The rugs were not as successful as I had hoped, so as I was washing the rest of the fleeces this winter, I began to think about what I could do with all of this wool I had on hand. 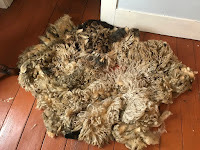 Here are some of the very last fleeces that I washed. 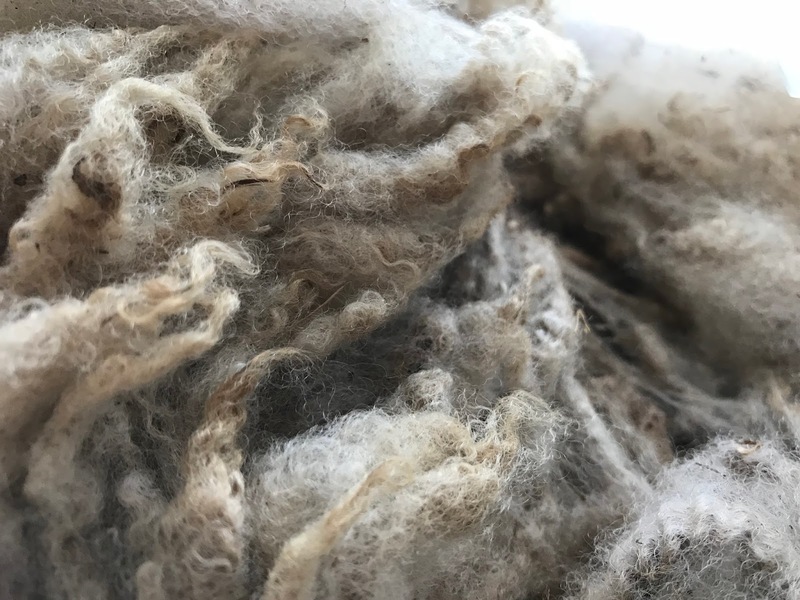 One thing that I had not counted on was that a clean fleece is about twice the size of a dirty fleece. 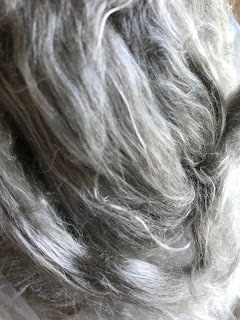 So very soon, I was being over whelmed by Jacobs fleece. I tried vacuum packing the fleeces to save space, but I felt like the fleeces were suffocating under all that plastic. I did a bit more research and found some heavy duty paper lawn bags, and that was a success! I was able to get 3 full sized fleeces in each bag, and 5 lamb fleeces will also fit in a single bag. Each bag is labeled according to the fleeces inside. 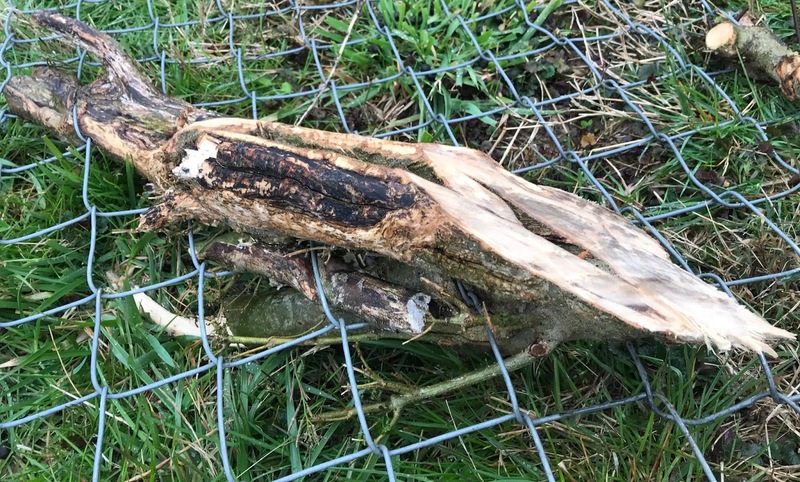 I did take the trouble to put like fleeces together, it is going to make a huge difference in the next steps. LouAnn was kind enough to loan me, once again her motorized drum carder. 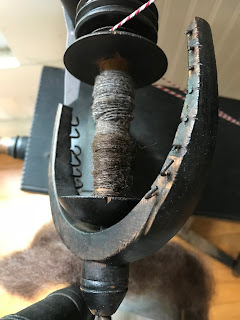 I will first re-card the batts that are left over from the roving rugs, and use those to spin the first bobbins. 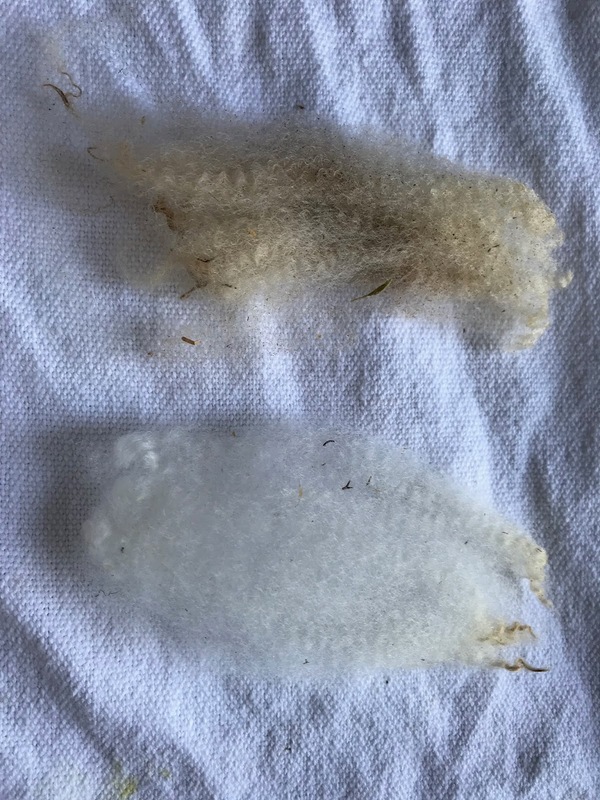 Here is what is left of fleece #3, #13, and some from Big boy. 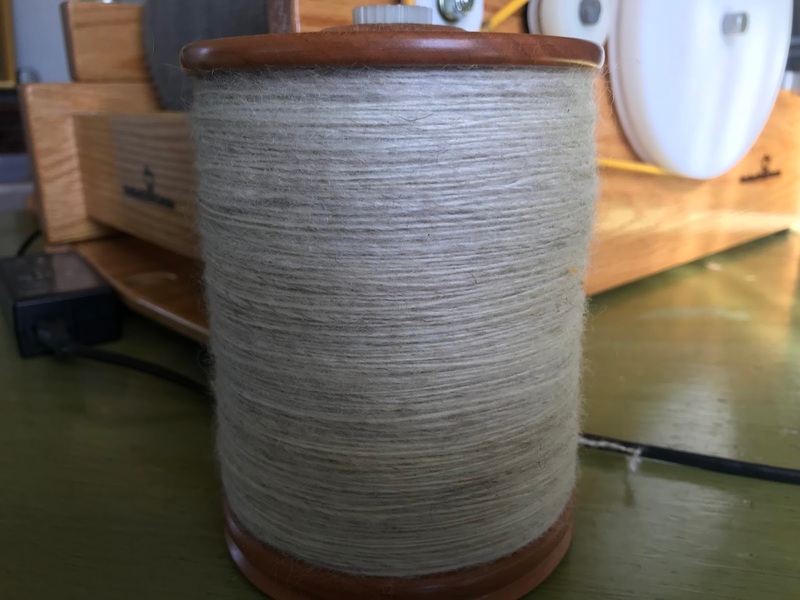 I am now busy spinning singles to weave into blankets, here is Olga #21, I think I will get almost 2 bobbins full from the batts that I had from Olga. The fleece from Heart #10 will also give me a couple of bobbins full of white for my blankets. 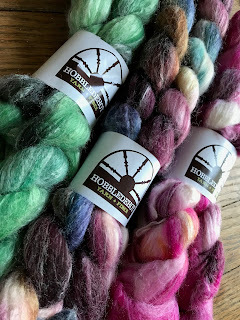 I am going to spin 12 bobbins full of a variety of natural colors that are in the Jacobs fleeces, so that I have a lot of colors to work with on my first blanket. 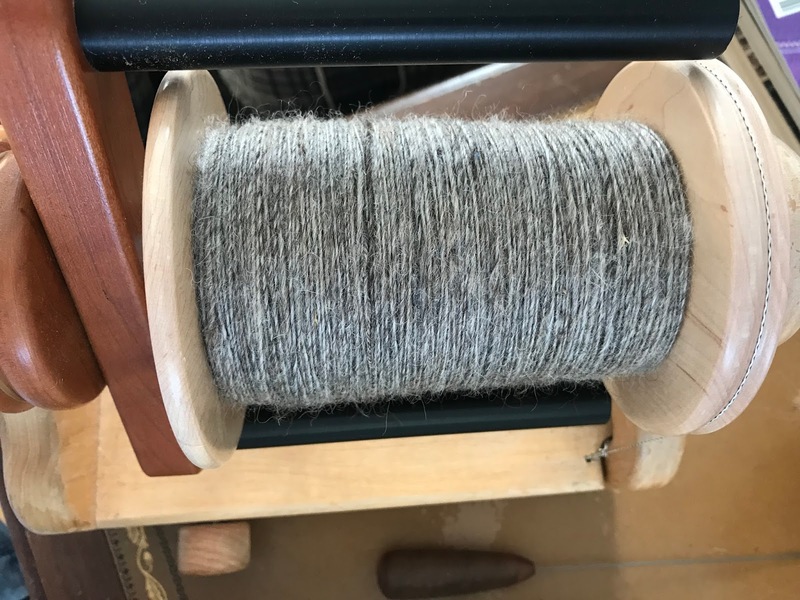 I know that as I finish spinning the yarn and begin to weave the first couple of blankets, I will be able to have better idea of what this wool can do, or rather what I can do with it! "#13, #3 and Big Boy" Large rug in the neighborhood of 30x48 inches. 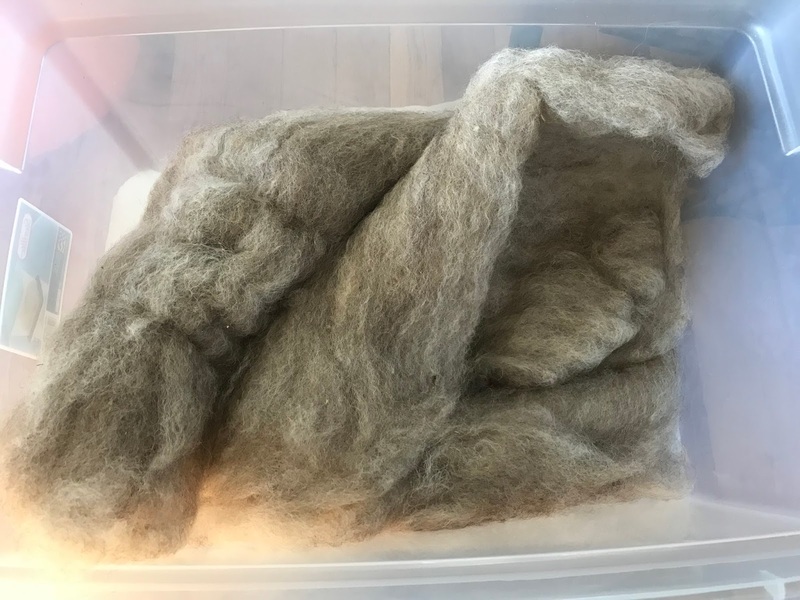 This size takes about 1 1/2 lbs of prepared fleece to make. 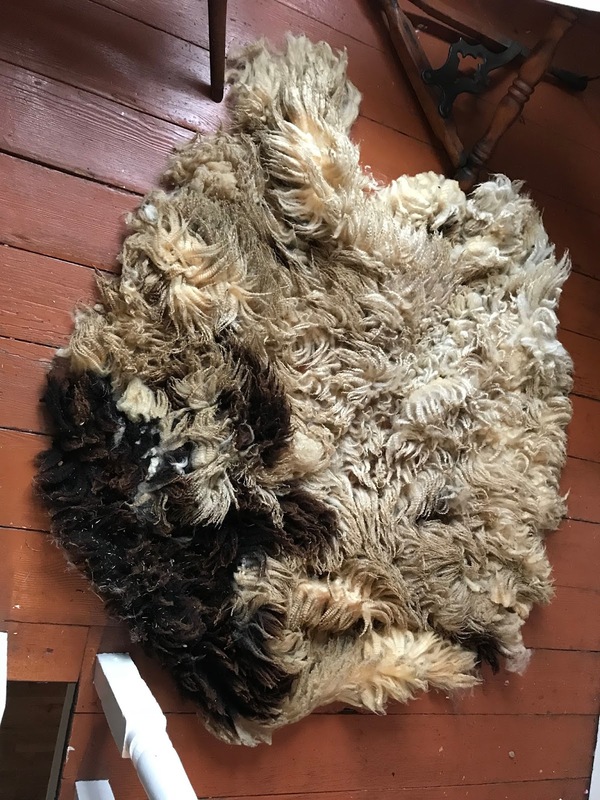 It seems that I don't have a picture on hand of the other large rug, that featured this same fleece trio, but in very different proportions, with the addition of Olga 21. This rug is made from "Olga 21 and Big Boy", it is a smaller rug in the neighborhood of 2ft by 3ft. These smaller rugs take around 12 ounces to make. We are back to good old "#13 and Big Boy" for this another small rug. 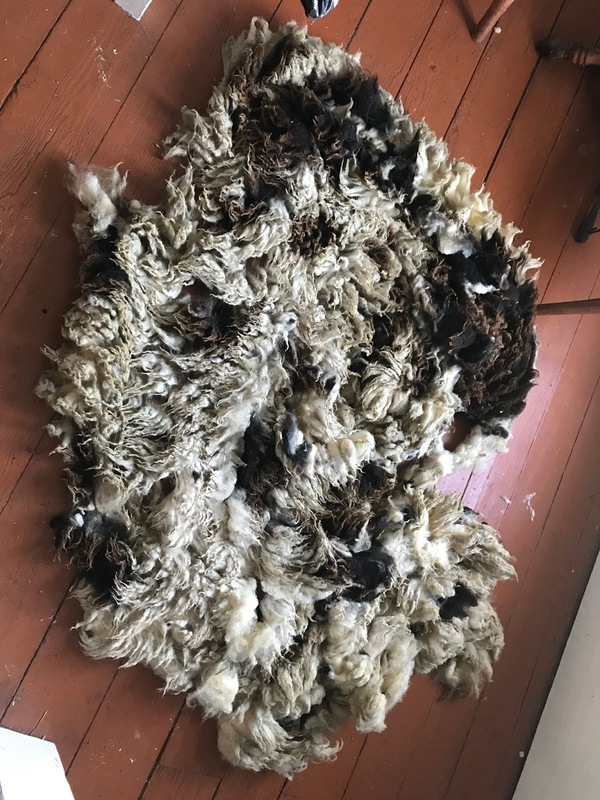 I have enough left over from the 4 fleeces to do at least one more of the small rugs. 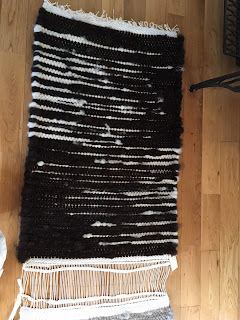 These three rugs were hot off of the loom when I took their pictures on Monday, and I had not as yet decided on a hem treatment, so you can see that the white fabric is still on the ends of the rugs keeping everything in place. 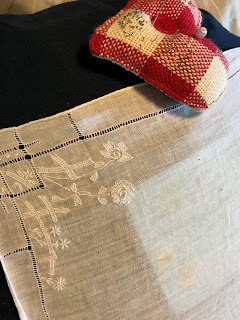 I was finishing up my chosen hem treatment on the final rug early this morning before I had to run to Knoxville to help set up our booth at the Jacobs Building, for the Foothills Guild Fall Craft Show in Knoxville, TN. The booth is all set up and ready for the holiday crafts shoppers. I don't have to work the booth until Sunday, when I will work the whole day and be part of the breakdown crew. That is the last of our 2 shows, and a few of us have been chatting off and on about what we are going to work on now that the show production is past for this year. I know that I have more projects in mind than I can ever hope to develop this year, and I know that it is the same for the others as well. I am sure that this is not an uncommon problem! 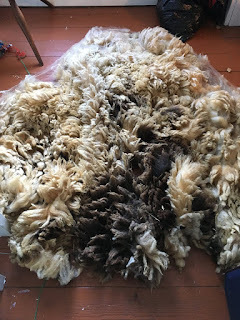 You may tire of seeing these fleeces appear on the blog, but to me it will be a record of the fleeces that I will be using in the rugs this next year. I will be able to pick out from the pictures of the raw fleeces, what the clean fleeces that are now stuffed in bags look like! 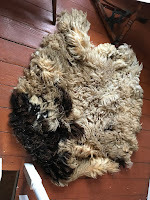 There is a lot of white in this fleece, it is a big fleece with a medium texture, so perfect for my rugs. After that is "Other Ram"
I know, what a name, all I have to go on right now is what is written on the bags. I hope to have more information as I go along. This fleece is huge, it took 6 big laundry bags to get it all in. It is also a medium coarse fleece, again perfect for the rugs. 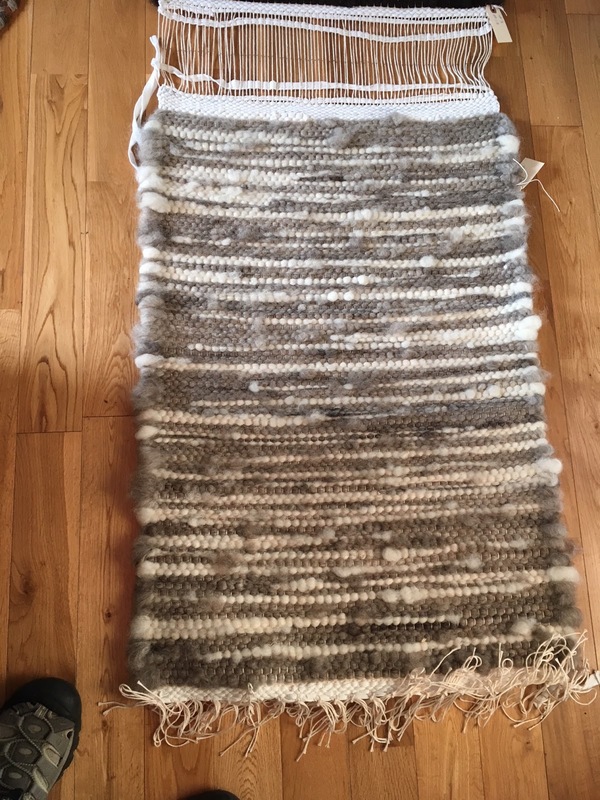 At the moment I am concentrating on finishing weaving the hand towel warp that is already on the loom and washing fleeces. Once the hand towels are woven, I will turn my full attention to the fleece rugs. I think I have enough warp on the loom to do another big rug, then I plan to do several smaller ones. All in time for the Foothills Guild Fall show in Knoxville in about 5 weeks. I am not feeling a ton of pressure, but I am working steadily towards my goal. I hope to finish everything well before the show, I hate waiting until the last moment.